Believe it or not, it was hard to feed me anything as a child. It took me hours to finish a meal on the dining table and I’ve been told many things will happen to me if I don’t eat. Things from “each grain of rice is equal to a bead of sweat from a farmer” to “the devil will make you into bulalo in hell” just to convince me to finish things off. One of the few things I did manage to eat was fried rice and I don’t think I’ll ever outgrow it. 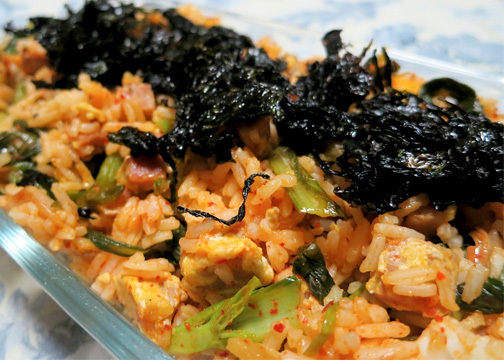 We made different versions at home but my current craving has a Korean twist. A few years ago, a friend prepared this after a long night of drinking and it was perfect hangover fare. I decided to make some since I haven’t had the chance to visit a Korean restaurant in ages. I’ve been craving for bibimbap but this is the next best thing for me. 1. Over medium heat, pour a little vegetable oil on to a pan and throw in the diced Spam. Let it brown a little before adding the garlic. 2. Once the garlic becomes fragrant, add the 3 eggs and scramble it up until it’s almost cooked. 3. Add the rice and break up any clumps. Add the chopped kimchi and its juice. You may add the red chili paste and sesame oil to spice things up. Season with a little salt and pepper. Mix well. 4. Serve piping hot in bowls and top with gim (seaweed). Et viola! 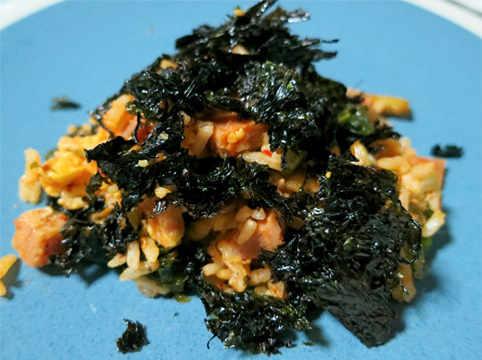 I’d like to convince myself that the probiotic benefits of the kimchi makes this dish a little healthier. I made this for tonight with a friend and she served it with a glass of sparkling Voga white wine. It’s the perfect meal for a lazy Sunday.